Do you want lead in the air you breathe? 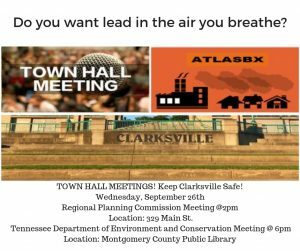 Thanks to your support, the Tennessee Department of Environment and Conservation (TDEC) has finally agreed to hold a PUBLIC TOWN HALL MEETING on the proposed AtlasBX lead acid battery plant in Clarksville! The problem is that they intentionally scheduled it the same day, WEDNESDAY, September 26th, as the Regional Planning Commission meeting at 2pm. What a terrible way to try and suppress public participation on this lead acid battery plant! We strongly encourage people to attend BOTH meetings if we are going to make a difference and be heard on this important public health and safety issue. We need your help asking the Regional Planning Commission at their 2pm meeting to HOLD or TABLE their vote on AtlasBX’s Site Plan until next month when people have had a chance to attend the TDEC Town Hall Meeting later that night at 6pm. But we cannot stress enough how important it is that you attend the TOWN HALL meeting at 6pm as it is your chance to publicly speak out and ask questions about the environmental impacts the proposed AtlasBX plant will have on our community. We fully expect TDEC and the pro-business backers of this Town Hall meeting to downplay the very real impacts that AtlasBX’s toxic emissions of lead and sulfuric acid will have on the hundreds of families that live and go to school near the proposed plant on International Blvd. So we need you there to keep them honest and to ask them the tough questions about not only the impacts this plant will have on our community but the cumulative impact it will have on our health and safety when added to the several other plants already releasing thousands of pounds of toxic particulates into our air and water!